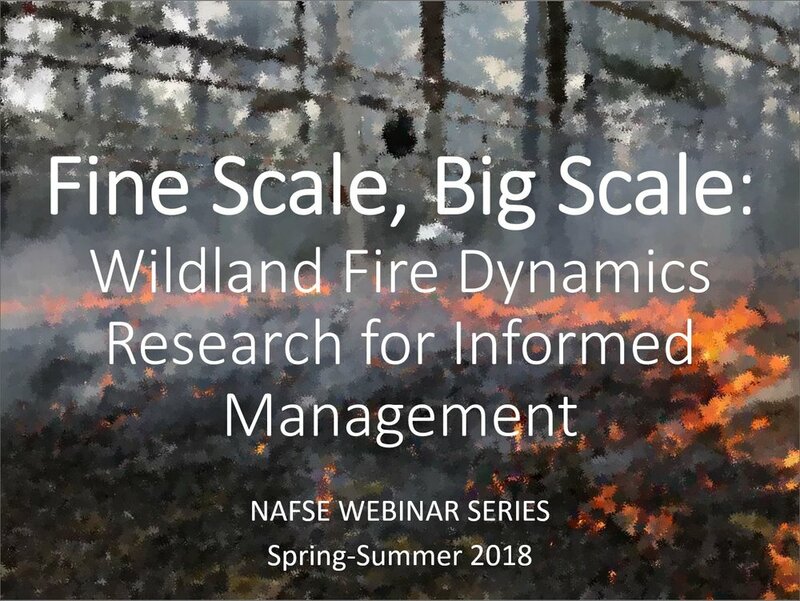 NAFSE offered this series of webinars focused on cutting-edge research in wildland fire dynamics. From fine fuels to wind tunnels, from field experiments to smoke models, this series related foundational research to operational management tools. This interactive webinar series covered research funded by the Department of Defense Strategic Research and Development Program, the Joint Fire Science program, and the USDA Forest Service Northern Research Station. From fine fuels to wind tunnels, from field experiments to smoke models, this series will relate foundational research to operational management tools. This interactive webinar series covers research funded by the Department of Defense Strategic Research and Development Program (SERDP), the Joint Fire Science program, and the USDA Forest Service Northern Research Station in cooperation with the New Jersey Forest Fire Service. Stay tuned for more! Traditional tools for predicting fire behavior have relied on generally defined vegetation characteristics to make broad scale predictions of wildfire behavior and fire danger. While these useful in wildfire suppression operations, they provide limited utility in the context of prescribed burns, which are planned and intentionally ignited to achieve more nuanced ecological or fuels objectives. Variability in moisture and structure conditions play a large role in driving outcomes of prescribed burns, but have not gained the much attention in refining predictive tools for guiding prescribed burning. Tune in and hear how Mike Gallagher at the Silas Little Experimental Forest is using new technologies and repeated fire experiments to develop new knowledge about the diversity of fuel conditions and fire behavior under prescribed burning conditions. The energy flow from a wildland fire is the most important measurable physical quantity. If we understand the time history of the energy flows, we can derive all other fire behavior and fire effects parameters. I will describe the difficulties in measuring the radiant heat release and explain a newly designed instrument. I will review the limitations of previous methods, as well as results obtained to date on prescribed fires in New Jersey and Florida. To provide a better understanding of combustion processes and fire behavior during planned wildland fires across spatial scales, we conducted 12 intensively-instrumented experiments on replicated 100 m2 plots, contrasting cool, dormant season vs. warm, growing season conditions, and natural vs. augmented fuel loads. Instrumentation consisted of a network of IR cameras, dense arrays of thermocouples, 18 sonic anemometers to measure turbulence and heat fluxes at multiple heights, and high speed pressure sensors. Some key processes are consistent across scales; for example, thermocouple temperature profiles and relationships between turbulence and heat fluxes measured during the 100 m2 plot burns reflect the inflow of cool air into fire fronts measured in laboratory experiments and patterns of turbulence and heat fluxes measured in large-scale field burns, while other phenomena can be considered “emergent properties” that occur only larger scales. The use of low intensity fires is a key tool in the arsenal of the wildfire professional. Nevertheless, there are fundamental challenges to understanding how these fire spread and consequently these fires present significant challenges to the application and use of existing fire spread models. This presentation will discuss the research approach taken to measure fire phenomena across multiple scales to study the ignition and spread of low intensity wildfires. The talk will discuss the use of laboratory-scale investigation to improve repeatability of experiments and to allow enhanced control over variabilities in the fuel and the environment – two key challenges when undertaking experimental fires in the field. The talk will touch on how measurements made in the laboratory can be applied at the field scale and vice versa. This will highlight the need for a multidisciplinary approach to the understanding of fire spread. In addition, the measurement of fundamental fuel characteristics and understanding their variabilities are necessary inputs for physics based fire models. Studying the fire processes in this way is key to understanding which mechanisms govern the spread of low intensity fires. This has direct implications the development of simplified spread and risk models. Development of a mid-scale wind tunnel that can bridge laboratory and field experiments will be discussed. In fire and wildfire science, the problem of linking laboratory studies to the field is the main bottleneck for the development and validation of fire spread models. The laboratory offers well-controlled conditions and allows testing and validating many configurations. The field offers more realistic conditions but they are very difficult to control. The main factor that hinders applying laboratory results to the field is the wind, because the flow around any field experiment is impossible to control and extremely difficult to measure. Similarly, laboratory experiments always involve some degree of idealization, not only of the wind but also of the fuel and other environmental conditions. Our mid-scale wind tunnel has been designed to allow collecting field data for realistic fuel and environmental conditions but under well-controlled wind conditions. Hence, it represents the missing link between the idealized laboratory conditions and realistic field conditions, particularly in the context of low-intensity prescribed burns. Our wind tunnel was constructed for both laboratory and prescribed field experiments. The tunnel can be disassembled into smaller pieces allowing us to bring the tunnel to the field. The tunnel provides flow speeds up to 8 m/s with a turbulent intensity of 20% in the test section, which represents the average wind speed and its fluctuation at Silas Little Experimental Forest Research Station. The test section is large enough to test an array of shrub and litter layer structures in both laboratory and field settings. Windows enable us to measure the properties of interest such as the vegetation geometry, the flow field around vegetation, the temperature field, the flame geometry, and the fire rate of spread. For the laboratory conditions, the tunnel has a 0.2 m deep fuel bed that can be used to provide more realistic boundary conditions, soil type and moisture contents, etc. A preliminary study using simplified fuel arrays will be presented as a demonstration. The outcomes of this research will contribute to the development of physics-based predictive fire spread modeling aimed at supporting wildland fire management in a more robust way than currently available. Detailed physics-based models of fire spread have the potential to provide unique insights into the driving mechanisms of fire behavior in various scenarios. They can be used both to investigate case studies targeted at understanding fire-fuel-environment interactions, and to help develop simpler operational tools – built on a robust foundation. However, current physics-based models suffer from a lack of testing, or validation, and the limitations and uncertainties of various model components need to be addressed. This is particularly true for low-intensity and backing fires, which have received relatively little attention in modeling efforts. This work leverages an ongoing set of unique, iterative, multi-scale experiments to interrogate and improve detailed physics-based models. Of particular interest is the ability to scale such an approach from a laboratory-type setting to a field environment, where computational resources become a limiting factor. This presentation will focus on an initial detailed investigation of laboratory-scale flame spread simulations and the impact of various model limitations. Areas for improvement and challenges related to scaling up the simulations will be discussed. Researchers use models to study ambient and fire- and forest canopy-induced turbulence because they help answer questions that field campaigns alone are unable to address due to, for example, the inability to control all degrees of freedom in the field. Possible applications of model studies of fire- and canopy-induced turbulence include improvements to predictions of smoke dispersion, tree mortality, and fire behavior. This webinar addresses efforts to simulate turbulent flows at the management scale, i.e., on spatial scales of 100 m to 10 km and temporal scales of minutes to hours. In the first half of this webinar, I place the SERDP management-scale modeling work in the context of the project as a whole, discuss some of the basic components of models used to study ambient and fire- and forest canopy-induced turbulence, and describe some of the challenges of simulating turbulent flows (including possible sources of uncertainty in model simulations). In the second half of the webinar, I show several examples of how models are used to answer questions about ambient and fire- and forest canopy-induced turbulence, provide an outline of the SERDP management-scale modeling strategy, and finally, end with a summary of the webinar presentation before opening the floor to questions.